The Schaeffler Group has extended its long-standing relationship with SETE (Société d'Exploitation de la Tour Eiffel) by providing additional services for the company that operates Paris' greatest landmark. Schaeffler's maintenance and asset management division FAG Industrial Services (F'IS) is not only providing technical support in selecting the most suitable rolling bearings, but also vibration analysis and bearing mounting services. The extended services agreement with SETE was brought about by an urgent need to replace the bearings in the cabins of the hydraulic elevator in the Eiffel Tower's western column. These bearings support a total weight of 20 tonnes, which means that they are permanently subjected to extremely high loads. Furthermore, the axial clearance of the original bearings was too large. It was therefore imperative to find an alternative solution. By working in close collaboration with SETE, application engineering experts from Schaeffler France selected the most suitable FAG tapered roller bearings. These bearings meet all requirements with respect to the radial and axial load ratings and can be easily integrated to the system. An experienced F'IS fitter provided on site support to the maintenance team that mounted the elevator cabin bearings, a task that took just one day to complete. 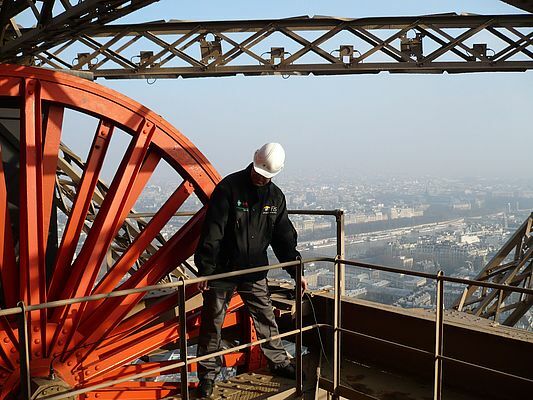 When the upper pulleys of the elevator in the eastern column of the Eiffel Tower needed to be inspected, SETE once again contacted Schaeffler France. Experienced F'IS engineers carried out measurements using an offline vibration measuring device. Afterwards, SETE received a detailed condition report on the bearings along with recommendations regarding future maintenance measures that should be taken. 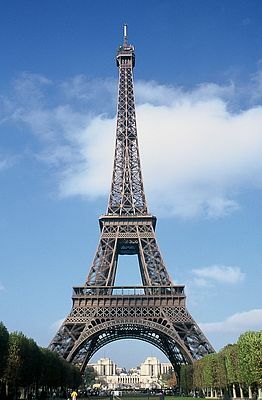 At the end of the 1980s, FI'S provided support to The Eiffel Tower operator for the first time in an extensive project to overhaul all of the famous landmark's mechanical systems. At that time, in order to modernize the elevators, the bronze rings in the pulleys were replaced with FAG rolling bearing systems. This significantly increased the reliability of the elevators. In 2002, Schaeffler was involved in the development and mounting of an INA gear ring, which aligns the revolving floodlight at the tip of the tower. Schaeffler and SETE are already planning more joint projects. What SETE particularly appreciates about the relationship with Schaeffler is its portfolio of rolling bearings that meet customers' increasing demands for innovation and higher quality. This portfolio is complemented by the extensive range of product and service solutions for the maintenance and repair of rolling bearings, which have helped reduce maintenance costs, optimise the elevators' efficiency and avoid unscheduled shutdowns.